The Israelite people were slaves in the land of Egypt, but God delivered them from their enemies. They left Egypt and traveled to another land called Canaan. God promised to give Canaan to the Israelites to be their own land. The stories in the mustard coloured book tell how God helped the Israelites defeat their enemies in Canaan. The leader of the Israelites was a man named Moses. One of the men who helped him was Joshua, who led the Israelite army. 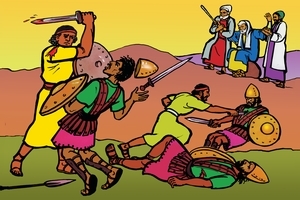 On their way from Egypt to Canaan, the Israelites were attacked by some of their enemies, the Amalekites. Moses told Joshua to choose some of the Israelite men to fight the Amalekites. While Joshua and the Israelites fought against the Amalekites, Moses stood on the top of the hill and lifted the rod of God up to heaven. He prayed to God that He would help the Israelites defeat their enemies. While he did this, the Israelites were winning the battle. Sometimes Moses' arms got tired and he would put them by his side. When that happened the Amalekites began to win the battle. Two of Moses' helpers, Aaron his brother, and Hur, were with Moses. They brought a stone for Moses to sit on. Then they held up Moses' arms all day, until the sun set. Because of this, Joshua and his men completely defeated the Amalekites. This was a great victory for the Israelites and they praised God that His power had saved them. Jesus is the leader of God's army today. People who love and obey God are like soldiers in His army. We are in Satan's battle against God. Satan tries to defeat us and make us stop following Jesus. We call on Jesus to help us win the battle. Sometimes we need the help of others in prayer, just as Moses did. When the Israelite people came close to the land of Canaan. Moses sent twelve men into Canaan to see what the land was like. He chose one man from each of the twelve tribes of Israel. Moses told them to look carefully at the crops, the cities and the people. The men were away for forty days looking through the whole land of Canaan. They brought back some of the crops of Canaan. Then they gave their report to Moses and all the people. Joshua and Caleb were two of the men. They told the people how good the land was, with abundant good crops. They said to all the people "Let us go up at once and possess the land. Don't be afraid. God is with us and He will help us to defeat our enemies." But the other men said, "No, the people of Canaan are bigger and stronger than we are. Their cities are large with high walls around them. They will destroy us." When all the people heard this they were very sad, and they cried. They were afraid, and said they would not go into Canaan. God was angry with the people because they rebelled against Him. They did not believe that God would help them to possess the land. God said that none of the people over twenty years of age would be permitted to go into the land of Canaan. Joshua and Caleb, and all the people under twenty were the only ones who would go into Canaan. When God promises to do something for us, we must believe that He will do what He says. There are many good promises in God's Word (the Bible) for all of us. We must trust God that He will do what He says and we must obey His Word. The people of Israel rebelled against God, so God made them wander around in the desert for forty years. All the people who did not believe God would help them possess the land of Canaan died during that time. Then Moses died and Joshua became the leader of the Israelites. God told Joshua to take the people into the land of Canaan. All the people were camped beside the Jordan River. They had to cross over the river to get into the land of Canaan. But the river was flooded at that time of the year and was very wide and deep. Joshua told the people to get all their things ready and to wait at the edge of the Jordan River, where they would see God do a great miracle for them. The priests (religious leaders) carried the Ark of God to the edge of the river. The Ark of God was a special box God told Moses to make. Inside the box were the two pieces of stone on which God had written the laws (ten commandments) He gave to Moses many years before. When the priests' feet were in the water at the edge of the Jordan River, God blocked off the river at a place a long way upstream from where they were standing. Then the priests carried the Ark of God into the middle of the riverbed. The priests stood there while all the people walked over the dry riverbed into Canaan. Joshua and all the people were very happy. 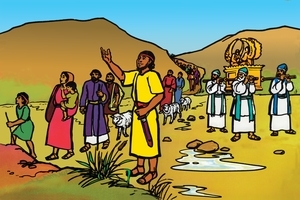 They praised God for His great power in helping them to cross over the river. Now they could live in the land of Canaan - the land God had promised to them. It is important that we know God's Word and obey it. If God's Word seems difficult for us, we must still obey Him. We can trust Him to help us. As we follow God, He will bless us and give us great joy and peace in our hearts. He will lead us in the right way and give us victory over Satan. Joshua and the Israelite people were now ready to live in the land of Canaan. But first they had to drive out all the people of Canaan. God had told them that they could not live together with the people of Canaan. God knew that those people would tempt the Israelites to leave God and teach them to worship false gods. The Israelites came to a city called Jericho, which had a high wall around it and very strong gates. The gates were locked so that no one could go in or out. Joshua sent two spies into the city. A lady named Rahab protected the spies. 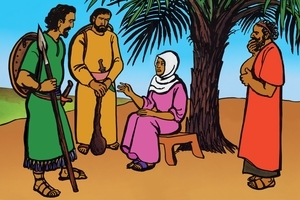 She helped them to escape when the soldiers of Jericho were looking for them. Rahab told the spies that all the people of Jericho were terrified of the Israelites because they thought that God would help the Israelites defeat Jericho. The spies told Rahab that they would protect her and her family when the Israelites attached the city. Joshua looked at the city of Jericho and wondered how they would fight against it. Then he saw a man standing near him with a sword in his hand. Joshua said "Are you our friend or our enemy?" The man said, "I am the Commander of God's army." 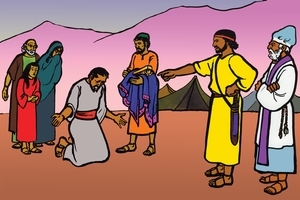 Joshua knelt before him and said, "What are your commands for us?" He told Joshua, "I have given the city of Jericho to you. All the soldiers are to march right around the city. The priests carrying the Ark of God will go with them, as well as seven priests carrying trumpets. Don't make any noise, just march quietly. They are to do this once a day for six days. On the seventh day they will march around the city seven times. Then the priests are to give a loud blast on the trumpets and all the people must give a loud shout. The walls of the city will fall down and you can go straight in and capture it. You must destroy all the people in the city. Do not take any possessions for yourselves. The gold and silver are to be kept for God. The rest is to be burned." Joshua and the Israelite army did as God had commanded. They marched around the city once a day for six days. On the seventh day they marched around the city seven times. The priests blew the trumpets, the people shouted, and the walls of Jericho fell down. Then the Israelite soldiers went in and captured the city. They destroyed everything and burned the city. The woman Rahab and her family were protected and they came to live with the Israelites. It was a great victory for the Israelite people. They praised God for His great power in helping them to destroy the city of Jericho. The Israelites wee very happy that they had destroyed the city of Jericho. But they did not know that one man, Achan, had disobeyed God. Achan had stolen some things from the city of Jericho. The Israelites went on to another city, named Ai. Joshua sent two spies to see what Ai was like. They came back and said that Ai was only a small city, which would not need all the soldiers to conquer it. So Joshua just sent a small army of soldiers to fight against Ai. But the Israelite soldiers got a surprise. The men of Ai came out and fought against them so strongly that the Israelite soldiers ran away and some of them were killed. Joshua and the leaders of Israel were very upset. They could not understand why God had not helped them. They prayed to God to find out what they should do. God said to them, "Israel has sinned. Someone stole some things from Jericho and kept them for himself. They were things that should have been given to God. This is why Israel cannot defeat her enemies. You must destroy the person who has done this evil. Unless you do, I will not be with you any more. Tell all the people to assemble before Me in the morning and we will find out who has done this terrible thing." Achan thought that no one had seen what he did. He did not think his bad deed would affect (hurt) anyone else. But God saw what Achan did, and the whole nation of Israel was affected by it. When we sin, we sin against God. This spoils our relationship with Him and with other people too. We must keep our lives right with God. Then our lives will be right with other people too. The next day, all the people of Israel gathered together and Joshua spoke to them He told them that they had been defeated by the people of Ai because someone had disobeyed God. But God would show them who was the guilty man who had caused God's displeasure. Joshua ordered the people of Israel to come forward in their tribes. The tribe of Judah was chosen as the guilty tribe. From that tribe the clan of Zerahites was chosen. From that clan the family of Zabdi was chosen. From that family the man Achan was chosen. 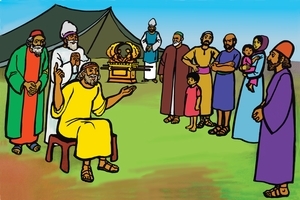 Achan confessed to all the Israelite people what he had done wrong. He said, "I have sinned against the God of Israel. In Jericho I saw a beautiful robe from Babylon, some silver and some gold. I took them and buried them in the middle of my tent." Then all the people of Israel took Achan, his family and all his animals, and stoned them to death. After this God was not angry with Israel any more because of Achan's disobedience. God told Joshua to take the Israelite army and fight against Ai again. This time they were successful and they destroyed the city of Ai and all the people who lived there. It is just like that for us too. We cannot have God's victory over Satan if we have sin in our lives. We must confess our sin to God and turn away from it. God can make us strong to have victory over the temptations that come to us. When the people of Canaan heard what Israel had done to Jericho and Ai they were very frightened. Five leaders (kings) of the (Amorite) people of Canaan joined their armies together to fight against Israel. But God said to Joshua, "Don't be afraid of them. You will defeat them." Joshua and the Israelite army marched all night to come to the place where the Amorite army was camped. They took the Amorites by surprise and won a great battle against them. 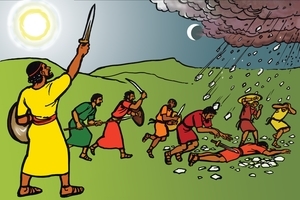 The Amorite soldiers ran away from the Israelites and as they did so God sent a great hailstorm which killed many of the Amorites. Then Joshua called out to God and asked Him to keep the sun and moon just where they were. God did this, and the sun and moon stood still. So the Israelite soldiers were able to completely destroy the Amorites. There had never been another day like this when God heard the prayer of a man and made the sun stand still. After this Joshua and the Israelite army traveled through Canaan. They fought against many cities and defeated them all. No one was able to withstand them. This helps us to understand how great God's power is. God's power is just the same today. We do not have to fear the power of Satan, or other people who want to hurt us. God has promised to be with those who obey Him. When we are with God, He defeats our enemies. When Joshua and the Israelite army had defeated all their enemies they settled in the land of Canaan. Joshua divided the land so that each tribe of Israel had its own area. The people had their own houses, vineyards and farmland for their animals. They were very happy that God had given them this good land. Many years later when Joshua was very old, he called all the Israelites together and spoke to them. Joshua said, "You remember all the great things that God did to bring us into the land of Canaan. You know how god helped us to defeat all our enemies in this Land. Now we have houses and land of our own in this land God has given us. He is God the LORD who keeps His promise. But listen, you must be true to Him. You must be careful to love God and to obey all of His commands. You must serve God with all your heart. If you turn away from God and make an alliance with any of the Canaanite people, or if you go and serve any of the false gods of Canaan, God will not help you any more. Your enemies will defeat you and you will become their slaves. You must make up your mind. Choose whom you will serve - either God the LORD who keeps His promise, or the false gods. But as for me and my family, we will serve the LORD." The people of Israel responded very strongly. They said, "We will also serve God the LORD, and only Him." Soon after this Joshua died, for he was an old man. But the Israelite people continued to love God and serve Him. We must make up our minds too. We cannot serve God the LORD and other gods at the same time. We must turn away from other gods and idols and all things that are bead. We must love God and obey His Word. We must serve Him with all our hearts. Then God will make us strong to do the things that please Him. For many years the Israelite people lived in Canaan. They obeyed God's Word as Joshua had taught them. They had victory over their enemies and they lived in peace. But later another generation of people grew up who did not remember the great things God had done for Israel. They did not remember Joshua or the things he had taught the people about God. They turned away from God and followed the false gods of the Canaanite people. They did many things that were wrong in God's sight. Because of this, God did not help them anymore. Their enemies fought against them and defeated them. Then the Israelites were in real trouble. But God did not forget His people Israel. He sent special people to be their leaders. They taught the people about God, and how to love and obey Him. When the people listened to their leaders and obeyed God, God helped them to defeat their enemies. One of these leaders was a wise lady named Deborah. She helped the people to follow God. At that time a Canaanite king named Jabin was fighting against Israel and causing them much trouble. Jabin had a big army and 900 iron chariots. Sisera was the commander of the army. Deborah sent for Barak, one of the leaders of Israel's soldiers. Deborah said to Barak, "God commands you to go and fight against Sisera and King Jabin's army. God will help you defeat them." But Barak said to Deborah, "I will only go if you go with me." So Deborah said, "All right. I will go with you, but the honour of conquering Sisera will go to a woman, instead of to you." Deborah knew she could trust God to do what He said. Deborah went with Barak and ten thousand Israelite soldiers to fight against Sisera and King Jabin's army at a place called Mt. Tabor. 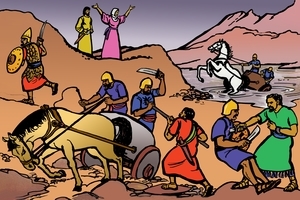 Sisera had 900 chariots and many thousands of soldiers. Deborah said to Barak, "Go, God has given you victory over Sisera." Barak and the Israelite soldiers came down the mountain and fought against Sisera and the Canaanites at the River Kishon. God sent a rainstorm which flooded the river and some of the chariots were washed away. Sisera got out of this chariot and ran away. In this way Barak and his men had a great victory over the Canaanites. Barak found out that God does what He says He will do. We can always trust God to keep His Word. Therefore it is important for us to know God's Word. God has promised to do many good things for us. We can trust God to do what He says He will for each of us. Sisera ran away from Barak and the Israelite soldiers. He came to the tent of a man named Heber. Sisera thought he would be safe there because King Jabin and Heber were friends. 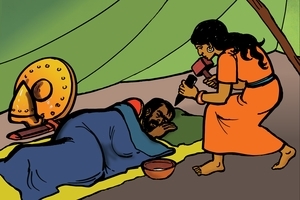 Heber's wife Jael was alone in the tent. She said to Sisera, "Don't be afraid. Come into the tent and rest for a while." So Sisera went into the tent and lay down. Jael brought him a drink of milk. Soon Sisera was fast asleep. Then Jael got a tent peg and a hammer. She crept up to Sisera and drove the tent peg through his head (temples) into the ground. A little while later Barak came by looking for Sisera. Jael went to meet him and said, "Come and I will show you the man you are looking for." Barak went into the tent and saw Sisera lying there dead, with the tent peg through his head. It was a great victory for Israel against the Canaanites. The words of Deborah came true. The honour for defeating Sisera was given to a woman. The Israelites wee very happy about their great victory over the Canaanites. 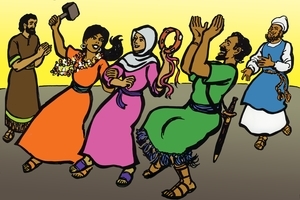 Deborah, Barak and Jael sang and danced with all the people. They praised God for the way He had defeated their enemies for them. The Israelites honoured Deborah and Jael. God had used these two women to help Israel defeat their enemies. Some people think that women are weak and men are strong. But God uses both men and women who trust Him. Deborah and Jael were not strong like the soldiers, but God used them to win a great victory for Israel. They trusted God's great power to help them, and He did! Friends, God uses those who seem to be weak to overcome those who are strong. God sent the Lord Jesus to save us from Satan. Wicked men killed Jesus, but God raised Jesus from death. He defeated Satan and all evil men. The Lord Jesus now gives power and everlasting life to all who trust and obey God. So let us sing and be glad too, and worship the only True God. Under the leadership of Deborah and Barak, the people of Israel had peace for many years. But later on, the people turned away from God again and worshipped the false gods of the people of Canaan. So God allowed some of Israel's enemies to come and defeat them. 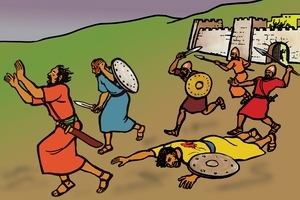 A large number of Midianites came into Canaan. They took away the crops and animals until the Israelites were left with nothing. 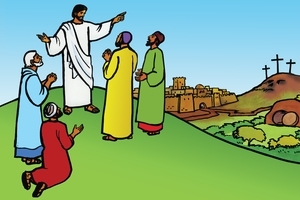 Then the Israelites cried out to God and asked Him to help them. But God told them that these troubles had come because they were worshipping false gods. One day a young man named Gideon was threshing wheat in a wine press. He was doing it there to hide from the Midianites. Suddenly the Angel of the Lord came to him and said, "Gideon, you are a mighty soldier and God is with you." Gideon replied, "How can God be with us if all these troubles are happening to us?" The Angel said, "I am sending you to fight against the Midianites and I will make you strong to defeat them." Gideon said, "But I am only a very unimportant member of a poor family. How could I possibly lead Israel to victory against our enemies? If you really have brought a message from God, do something to show me that what you have said is true." 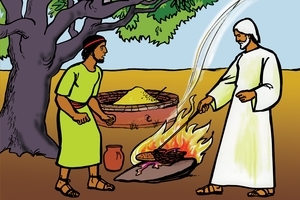 Gideon went away and prepared some meat and bread to give as an offering to God. When he brought it back, the angel told him to put it on a rock. Then the angel touched it with his rod. As he did so, fire came out of the rock and burned up the meat and bread and the angel disappeared. Then Gideon knew that the message was from God. Sometimes we are like Gideon and feel that God is not helping us any more. If we turn aside from following God then He does not help us. But we must remember that God never changes. His power and goodness are always the same. Even though we feel we are weak or unimportant God can use us. Listen carefully and I will tell you some more about how God used Gideon. Gideon knew that God had spoken to him about leading Israel to fight the Midianites. He wondered how God was going to do this. Gideon's parents and other members of his family had built an altar to the false god Baal. They also had an idol of the goddess Asherah. God said to Gideon, "You must destroy the altar of Baal, and cut down the idol of Asherah." 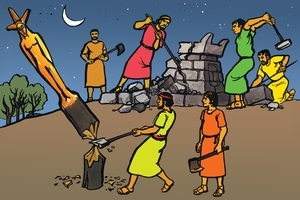 That night Gideon with ten of his servants broke up the altar to Baal and cut down the idol of Asherah. They did this at night because they were afraid of what the people in the village would do if they saw their idols being destroyed. Next morning the people saw what had happened and they were very upset. They found out that Gideon had destroyed the altar to Baal and the idol of Asherah. So a large group of people went to Gideon's house. 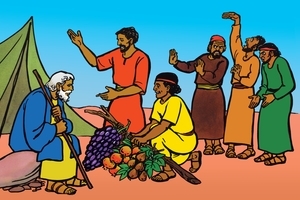 The people called out to Gideon's father, Joash, and demanded that he send Gideon out to them. They said that Gideon should die for what he had done. But Joash said, "Why does Baal need your help? Let Baal himself act against the person who broke his altar." Eventually the people quietened down and went away. Later on, Gideon told the people what God had asked him to do. The people listened to Gideon and some of them went with him to fight against the Midianites. Sometimes we have things in our lives that are like idols. They are things that we love much more than God, and they make us turn away from following God's way. God is not able to use us if we hold on to these things. (Name things that are specific problems in your area.) We must put these things out of our lives completely. This may be difficult for us to do, just as it was for Gideon, but God cannot help us until we turn away from those things and obey God's Word completely. 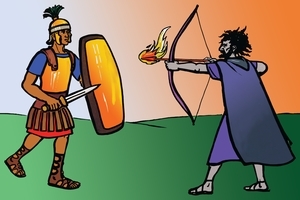 At that time Israel's enemies, the Midianites, joined up with some other people to form a large army. They came into Canaan to fight against Israel. Gideon gathered many of the Israelites together to prepare for the battle. Their number seemed very small compared to the huge army of their enemies. But God said to Gideon, "You have too many men (soldiers). I don't want Israel to say they defeated their enemies by their own strength. When they win the battle I want them to know it was God's power that did it. Tell the men, if anyone is afraid of the battle he can return home now." When Gideon told his men this many of them went home. God said to Gideon, "You still have too many men. Take them down to the water and I will show you which men to take with you." 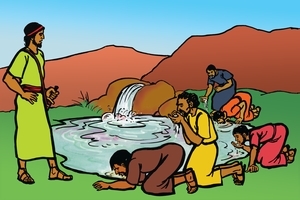 So Gideon took the men down to the water to have a drink. God said to Gideon, "Watch them carefully. The men who lift the water up in their hands and do not put their faces right in the water, are the men to choose." Gideon watched the men carefully and chose those whom God had shown him. When he had finished he had 300 men. This was only a very small number against the huge army of the Midianites. But God said to Gideon, "With these 300 men I have chosen I will give you victory over the Midianites." Sometimes it seems as if we are fighting against enemies that are much bigger and stronger than we are. But we need to think about God. He is much greater than any god, and no one is able to defeat Him. When we want to obey god, He will show us very clearly what He wants us to do. God always gives us the strength and courage to obey Him and to overcome our enemies. Gideon and the 300 men prepared for battle against the Midianites who were camped in a valley just below where Gideon and his men were. In the Midianite army there were more people than anyone could count. 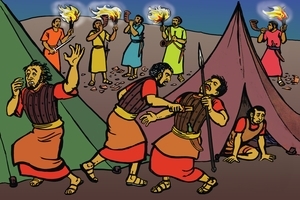 Gideon crept up close to the camp and heard some of the Midianite soldiers talking. One man told about a dream he had, and another said it must mean that Gideon and his men would soon defeat them. 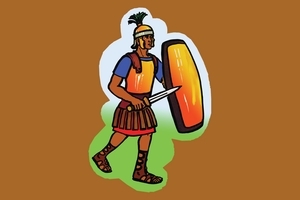 The Midianite soldiers were very frightened. Gideon knew that God would help the Israelites to win the battle. In the middle of the night, Gideon and the 300 men went close to the Midianite camp. Each man held a pottery (clay) jar with a light (torch) hidden inside it and a trumpet. 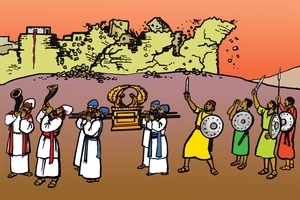 When Gideon gave the signal each man broke his clay jar and held up the light, he blew his trumpet and shouted "We fight for God and for Gideon." The Midianites saw the bright lights appear suddenly and heard the shouting and the trumpets. They were terrified and ran around in great confusion. They began to fight each other and soon many were dead. Others ran away because they were so frightened. Gideon sent a message for the other Israelite soldiers to come and help them. Then they all chased after the Midianites. That day the Israelites had a great victory over the Midianites, just as God had promised Gideon. We can trust God to keep his promises to us too. We do not need to be afraid of our enemies. We must think about God's great power and obey all the things He tells us to do. He will help us to live in a way that pleases Him. Gideon was the leader of Israel for 40 years and during that time there was no war in the land. But after Gideon died the Israelites turned away from God and worshipped the false gods of the Canaanites. So God let the Philistines defeat Israel. The Philistines made the Israelites their slaves. God prepared a man named Samson to be Israel's leader and to help them defeat the Philistines. When Samson was born, his parents dedicated him to God. 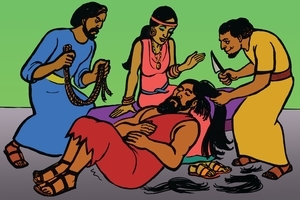 They made a vow to God that Samson's hair would never be cut, and that he would never eat unclean animals or drink anything from the grapevine. These would be special signs to show that he belonged to God. God's Spirit (the Spirit of the Lord) gave Samson great strength, so that he could win battles against Israel's enemies. But Samson did not always obey God's Word. Many times he just followed his own ideas. Samson saw a Philistine woman who pleased him, so he asked his parents to make the arrangements for him to marry her. His parents were unhappy about this. They knew it was against God's Word for an Israelite to marry a Philistine, but Samson insisted. Samson traveled to Timnah, where the Philistine woman lived, to make the wedding arrangements. On the way a lion attacked him. God's Spirit made Samson so strong he killed the lion with his hands. 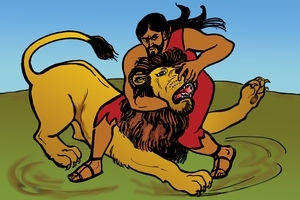 God gave Samson strength to kill the lion so that Samson would know that God could help him to do even greater things to help free the Israelites from the power of the Philistines. Samson was very strong, but his life was not fully under God's control. Sometimes he did things that did not please God. Samson married the Philistine woman, but her friends were very bad to Samson. They cheated him and made him very angry. Samson went back to his home and left his wife with her parents. While he was away the woman's father gave her to be the wife of a Philistine man. Later Samson came back to see his wife and found out what had happened. He was very angry, so he went and caught 300 foxes and tied them together in pairs by their tails. 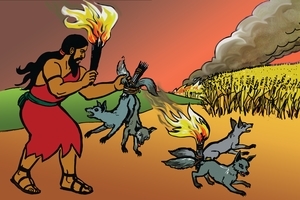 Then he tied burning torches to their tails and let them go to run through the Philistines' wheat fields. This caused huge fires and destroyed all their wheat crop. The Philistines were very angry and wanted to kill Samson. They sent many soldiers to fight against him, but God gave him great strength and Samson was able to kill many of the Philistines. In one battle he killed 1,000 Philistines by himself. God gave Samson strength so that he could help Israel defeat their enemies, the Philistines. But still Samson did not obey God's Word completely. It was because of this that the Philistines eventually defeated him. Listen and you will hear what happened. Samson was the leader of Israel for twenty years. But even though he was very strong, many of the things he did were not right in God's sight. Samson saw another Philistine woman that he liked. Her name was Delilah and he went to stay with her. The leaders of the Philistines came to Delilah secretly and asked her to find out the secret of Samson's strength. They said they would give her a lot of money if she could do this. So Delilah asked Samson many times what made him so strong. Each time Samson gave her a wrong answer. But she kept asking him so many times that eventually he grew weary and told her the truth. He told her that his hair had never been cut because of a vow his parents had made to dedicate him to God. If someone cut off his hair then he would lose all his great strength. Delilah told this to the Philistine leaders and they sent some men to capture Samson. One night when Samson was asleep, Delilah told the Philistine men to come. They cut off Samson's hair. Samson woke up and tried to fight the Philistines as he had done before but his strength was gone. God was not with Samson as He was before. By this time, Samson's hair had grown long again and he knew that God was with Him. He could not see, because the Philistines had put out his eyes, but he could feel the two big pillars in the center of the temple that held up the roof. Samson prayed to God and asked Him to make him strong just once more, so he could defeat the Philistines. 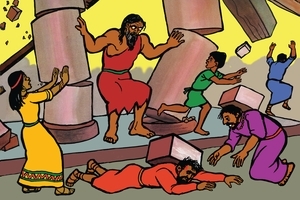 Then Samson pushed with great strength against the two pillars in the center of the temple. This made the whole building fall down and all the people inside were killed. Samson was killed too, but he had gained a great victory over the Philistines. Before he was born, Samson was chosen by God to do a special task. God gave him much strength to defeat the Philistines. After Samson was mocked and defeated by his enemies, he repented and God gave him a mighty victory at the end of his life. God has a plan for our lives too and it is very important for us to obey Him. Now we have heard about some of the great Israelite leaders whom God helped to win many victories. Many years later God sent His Son Jesus to live on the earth. He lived in the land of Israel. Jesus showed us how to live in the way God wants mankind to live. Jesus always pleased God. He had power to defeat Satan and all evil things. One day Jesus met a man who was possessed by many evil spirits. He was a very wild man who wore no clothes and lived among the tombs. People tried to bind him with chains but he just broke them and ran away. When the man saw Jesus he fell down before Him. Jesus told the spirits they had to leave the man. They screamed out, "Jesus, Son of the Most High God, don't punish us." But Jesus commanded the spirits to come out of the man. He sent them into a herd of pigs that were nearby. The pigs then ran down the hill, fell into the lake and were drowned. The man who was possessed by demons was healed. He was not wild any more. He sat down quietly with Jesus. The man wanted to go wherever Jesus went, but Jesus told him to go home and tell his family what wonderful things the Lord had done for him. The man went and told the whole city what Jesus had done for him. Jesus is the Saviour. He has power to forgive sin. 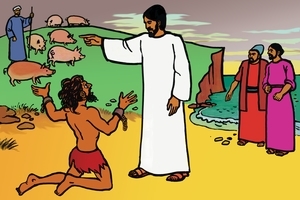 Jesus wants to forgive the sins of all people who ask Him to. Jesus is able to change our lives. When our sins have been forgiven and our lives have been changed by the power of Jesus, we want to tell others that Jesus can change their lives too. Another time Jesus went into the temple of God in Jerusalem. This was the place were the Israelites came to worship God and to make sacrifices to Him. Inside the temple Jesus saw men buying and selling animals for people to sacrifice. They wee cheating the people and making money for themselves. This made Jesus angry. He made a whip out of some pieces of rope and drove all the animals out of the temple, as well as the men who were selling them. 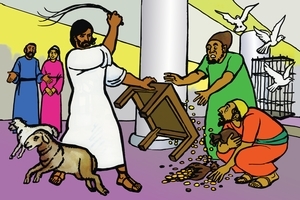 Then he tipped over the tables of the men who were trading, and scattered the money everywhere. Jesus said to them, "The Scriptures say that My house is a place of prayer - but you people have made it a den of thieves." Jesus is Holy. He hates all sin. The men in the temple were religious people, but Jesus knew their hearts and He was not pleased with their cheating ways. Followers of Jesus need to be careful that their thoughts and words and ways are pleasing to God. Only Jesus can make people live true and holy lives. The Israelite leaders did not believe that Jesus was the one sent from God to be the Saviour of the world. They did not want Jesus to be their leader (king). They took Him to court and asked the Roman Government to crucify Him. So Jesus was killed on a cross and buried in a tomb. But Jesus did not stay in the tomb. On the third day God's great power raised Jesus from the dead. Jesus was alive again. He had defeated Satan, sin and death. For forty days after Jesus rose from the dead, He appeared to His followers. He talked with them and ate with them. Before He returned to His Father in heaven, Jesus said to His disciples, "All authority in heaven and earth has been given to me. Therefore go and make followers of all nations. Teach them to obey everything I have commanded you and remember I will always be with you." Jesus' power gives victory over Satan, evil spirits and evil men. Jesus' death and resurrection has broken the power of sin and death. He gives spiritual fire to all who follow Him. His great power helps us win over sin that tries to defeat us. Jesus wants us to share His message with all people everywhere. We have heard how God's great power helped the Israelites to defeat their enemies. But what about us? How can God help us? God's Word tells us to remember that our own strength is not enough. But if we have asked Jesus to take away our sin and to come into our lives, He does. His mighty power is within us to help us every day. Sometimes we find that our struggles are against evil people who want to harm us. But our struggles are not only against people. We are fighting against Satan and huge numbers of evil spirits whose power is very great. Their aim is to spoil God's good work in us. Jesus defeated Satan and He gives us power to stand against Satan. We must have the right protection like the soldier in this picture who is ready for war. First, Christ's truth holds us firm. So we believe and speak only with is true. We need truth all around us like a belt. Christ's righteousness has been given to us, so we love others and do what is right. This is like a breastplate that protects us from Satan's temptations to make us do evil. We must tell others about Jesus' way for us to have peace with God. That is like wearing good shoes that help us to stand firm, and keep us from slipping into Satan's ways. Satan wants us to doubt God's Word to us. Satan's lies come at us like fiery arrows. We must trust God to do what He says in His Word, and not doubt at all. That is like having a strong shield to ward off Satan's fiery arrows. Jesus took the punishment for our sins and he has given us salvation. This is like a strong helmet to protect us when Satan lies to us and says that God has forsaken us. We must remember to use the Word of God. This is the sword of God's Spirit and we can use it to attack Satan and overcome him. All the time we must pray to God. We can ask Him for the things we need and ask Him to guide us in everything we do. If we wear God's armour every day our lives will be useful for God. May these stories about God's heroes help us to be brave soldiers in God's army too. See different versions of this script in Afrikaans, Buhutu, Chinese Simplified, English: South African, French, Herero, Indonesian, Kimwani: Ibo, Lomwe: Mozambique, Malagasy Merina, Ngonde, Northern Sotho, Pijin: Solomon Islands, Portuguese: Brazil, Portuguese: Mozambique, Russian, Sena: Mozambique, Shimaore, Shona, Spanish, Swahili: Tanzania, Takwane, Tok Pisin: PNG, Tonga: Malawi, Tsonga, Umbundu, Urdu, Venda, Xirima, Yao: Malawi, Zulu.